Puppy teeth – yes indeed, they do hurt! Puppy biting is a perfectly natural behaviour. Puppies use their mouths to explore their surroundings; nothing is sacred from puppy teeth. They also use their teeth when playing. Fortunately, this is something they usually grow out of when they lose their puppy teeth at around sixteen weeks. Puppies themselves learn that their teeth are sharp when they are still with their mother and littermates. They begin to hurt their mother’s teat when feeding and she will get up and walk away. The pup learns there is a consequence to using teeth. They also learn the consequences of using their teeth too hard when playing with their littermates. If they use their teeth too enthusiastically, the game will end one way or another. Either their littermate will yell in pain and stop playing or they may end up fighting. Remember that dogs only have one defence if they are in pain, frightened or cornered and that is to use teeth. This does not make a bad dog – it is simply dog behaviour. Your job is to teach the dog that teeth are not allowed on human skin! You also need to teach him to have a soft mouth. To help him learn to inhibit his bite you need to act like a playmate. Never use your hands or body as a toy when playing with your puppy. Instead use a suitable toy. If your puppy catches your skin or clothes when you are playing, yell ‘ouch’ – a good high pitched yell is needed as though he really hurt you. Get up, move away from your puppy and stop playing. Redirect his teeth onto something more acceptable, a stuffed Kong, the cardboard innards of toilet roll or kitchen roll, a toy or a raw hide chew. 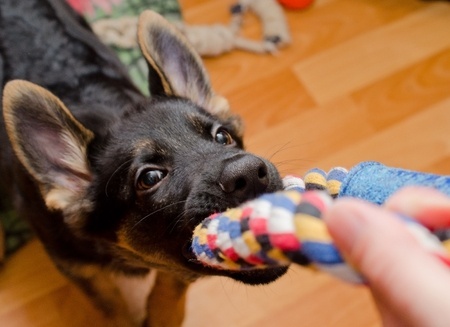 (Don’t give your puppy cheap plastic toys to chew as they can be dangerous if swallowed.) Many puppies under 14 weeks will back off when you yell, then come back and lick you. Praise and redirect the play onto something appropriate.